As a way to help you make a decision, we offer up to 5 unique swatches at no cost. A swatch is a small piece of fabric that will allow you to feel the texture of the fabric, and see the color. On a fabric with lots of colors you may not see all of the colors but you will get the vibe. The swatches are about 1" x 3". We do not offer large swatches. We will send out one set of complementary swatches. When you place an order you may request another set of swatches or request some at a future date. If you need more swatches, you may purchase a pre-set or custom swatch set. We reserve the right to refuse to send swatches to an individual who takes advantage of this offer. 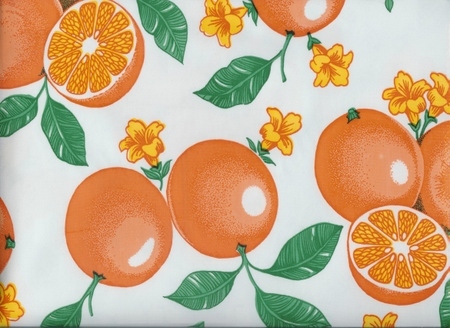 No napkin required for these refreshing orange slices on oilcloth. The Oilcloth is 47" wide.